In fact, many investors have bet against Japan over the years . . . and lost. A common mistake over the past two decades has been shorting Japanese government bonds — trades which have mostly ended in a trail of tears. In a country where interest rates have moved slowly but consistently lower over the past two decades, investors who have gambled on the thesis that Japan’s financial structure is unsustainable have been forced to learn one of the harshest lessons of investing: There is little difference between being early and being wrong. So, how exactly have interest rates in Japan remained so stubbornly low in the face of a persistently stagnant economy and high and growing debt? Why aren’t investors demanding higher rates of return? Can this economic anomaly continue? If so, for how long? If not, when does Japan cross the event horizon for a major shift in fortunes? The answers to these questions have proven so elusive over the years that I figure it’s time to try to get to the heart of the matter. After all, it’s not just about Japan: A better understanding of Japan’s fragile economic imbalances sheds light on current events in Europe and the United States, which, in the aftermath of the 2008 financial crisis, have implemented policies similar to those that have been pursued by Japan. The story begins with Japan’s post-war economic miracle. In order to rebuild its economy after the devastation of World War II, the Japanese government adopted an export model to boost export growth and import know-how. Japan invested heavily in education, research and manufacturing. A key element of the export model is, of course, accommodative monetary policy whereby a country uses credit creation, infrastructure development, and lower-than-market interest rates (known in monetary parlance as “financial repression”) to focus the country on exports. As the original “Asian Tiger,” Japan employed this strategy to great effect over the years, growing GDP sharply on the back of strong exports. As long as GDP and exports are growing, this model works. But when GDP stops growing and exports slow, the model fails. The point of failure for Japan was when its easy monetary policy stimulated a real estate and stock market bubble instead of fueling exports. In 1985, the major economies of the world (United States, Japan, West Germany, France, and the United Kingdom) coordinated the Plaza Accord to reduce the value of the dollar relative to other major currencies (including the yen) with the specific intent of reducing trade imbalances. In the 24 months after signing the accord, the yen appreciated by 50%. By mid-1986, the rising yen had forced Japan into a recession (because the stronger yen harmed the country’s exports). As illustrated by the dotted line in Figure 1, the Bank of Japan (BOJ) responded by reducing the official discount rate five times between January 1986 and February 1987, leaving it finally at 2.5% — which remained in effect until May 1989. The BOJ was ferociously trying to stimulate the economy with aggressive easing. 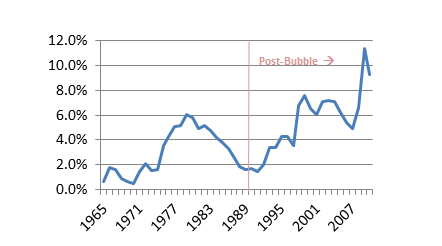 In addition to low rates, the BOJ maintained high levels of money supply and credit growth, which drove the creation of the bubble as illustrated in Figure 2. Sources: Bank of Japan, CFA Institute. Sources: World Bank, CFA Institute. The bubble manifested itself in both real estate and the stock market. It finally popped as the BOJ raised interest rates in 1989–1990, with historic collapses from which — even now, some 22 years later — the country has not recovered. Nevertheless, Japan has been able to finance itself at extremely low rates during those 22 years. How? The financing of federal governments is much more complicated than the simple taxation of citizens. Governments finance themselves through some combination of direct taxation of citizens, taxation of businesses, tariffs on imports from other countries, build-up and usage of foreign currency reserves from international trade, issuance of debt, and money printing (if possible). Therefore, Japan’s ability to finance its federal government will be determined by the health of its GDP growth (which grows tax revenues, all else equal), its ability to grow federal tax revenues, its ability to control its budget, its ability and willingness to use its substantial foreign exchange reserves, and perhaps most importantly, its ability to continue selling bonds to the public. The secret of Japan’s ability to finance itself over the past 22 years is that it has used its current account surplus to create a closed loop — more money flows into Japan than flows out, and that net inflow is largely invested in JGBs (Japanese government bonds). Here’s how it works: on the trade side, Japan exports more than it imports bringing more capital into Japan than leaving. Japan has maintained a trade surplus for about 30 years. And because of this persistent trade surplus, Japan has built up a large portfolio of foreign currencies. These foreign currencies are then invested in foreign assets (e.g., U.S. Treasuries) earning Japan a steady stream of income. Because this portfolio is large, Japan — as a country — regularly earns more income on its foreign currency holdings than they pay out to foreign investors. In combination, the trade surplus and the income surplus brings new money into corporate Japan. Corporate Japan places that money into the banking system, which then gets levered up and dramatically expands its purchasing power. Then the banks, life insurance companies, and pension funds turn around and buy lots of JGBs (accompanied with much pressure/regulation by the Bank of Japan). In fact, the major banks, such as Bank of Tokyo-Mitsubishi UFJ, Sumitomo Mitsui, and Mizuho, regularly buy JGBs — even viewing it as a “public mission” to support Japan. In addition, the Bank of Japan buys lots of JGBs on the open market, trying to drive up prices and drive down yields, thereby manufacturing low rates. While this monetization of debt creates inflationary pressures, it has thus far been offset by the deflationary pressures of a declining workforce and declining population. There are short-term fluctuations from year to year, but it is clear when looking at averages decade by decade that funding pressures in Japan have been growing over time. As you can see in Table 1, this is the answer to the original question. This cash flow cycle is how Japan has funded itself over the past 22+ years. Only now, the profile is changing. The Japanese debt crisis is being spawned by a burgeoning fiscal deficit. As the fiscal deficit has expanded, it has placed greater pressure on the Japanese government to sell debt and on the Bank of Japan to purchase it. Of course, the BOJ has been stepping in and buying JGBs when corporate demand has not been strong enough to keep rates low, as illustrated in Figure 3. Although Japan probably still is often thought of as a high-saving society, this is no longer true, at least for households. Japan’s household savings rate is now around 2% (down from a peak of 44% in 1990). So, in combination with chronic, large fiscal deficits, Japan’s low bond yields appear to present an oxymoron. However, Japan has also maintained a high corporate savings rate and low levels of fixed investment (both residential and nonresidential), making Japan a net exporter of capital. However, its fiscal profligacy is catching up with it: Its fiscal deficit has risen to more than 11% of GDP, where it remains today. Up to now, Japan has been able to finance this funding deficit, as illustrated in Figure 4, primarily by issuing bonds. Historically, these bonds have been purchased by the public through various channels, ranging from household purchases to corporations to domestic banks to the post office. However, the aging of Japan’s population is altering the fundamental demand structure for bonds. Sources: Ministry of Finance, CFA Institute. Although the aging of Japan’s population has been much discussed over the years, it is just now beginning to manifest itself — and as people become old, they tend to spend their savings rather than accumulate more savings — a process known as dissaving. Ominously, Japan’s population declined for the first time in 2009 (and has been declining ever since). Already about 30% of Japan’s population is elderly; that figure is expected to grow to about 40% over the next 30 years or so. And given Japan’s welfare society system, their (shrinking) working-age population will save less and less as their burdens in supporting the dependent-age population (both young and old) grow more and more. According to a McKinsey study, savings rates in Japan decline markedly after people turn 50 years old. Given its demographic profile, Japan’s combination of aging and life cycle effects will continue unabated. At present, Japan has just over 127 mm people. According to the National Institute of Population and Social Security Research, Japan’s population — 20 years from today — will shrink to about 118 mm by the year 2032 (with an even greater deceleration in the working age population). Today, Japan’s GDP per capita stands at about ¥3.7 mm per person. Assuming they can maintain this level over time and keeping inflation neutral, Japan’s GDP would shrink from ¥476 trillion today to about ¥442 trillion in 2032. Given the ongoing massive fiscal deficits which Japan finances through similar levels of debt issuance, their national debt levels will rise to ¥2.4 quadrillion (rising from ¥980 trillion today). Another big question mark is of course interest rate levels. Even assuming their average interest cost on debt remains unchanged from today’s levels, Japan’s debt service will consume over 50% of the federal budget by 2032 (up from 23% today). With a populace that does not favor immigration, it seems that the die is cast. Japan will inevitably age and shrink — but not its debt. In part two of this article, we’ll examine when Japan will cross the event horizon. If Japan have so good earnings from exports why are they dependent on debt? They should focus on cutting their debt rather than investing earnings in U.S. treasury bonds. We keep on hearing about hovering debt of U.S. and Major part of this debt is owed to China and Japan. Now, my question is that why Japan is lending money to U.S. when they themselves are dependent on debt…Kindly answer. Simple questions with big, complex answers. Regarding why Japan lends to the US and others when they are dependent on debt themselves … in a word, globalization. Global currency system, global debt, global trade, etc. A key reason that rates are low around the world is because of the interplay between trade surpluses (in countries like Japan) and investments in local bond markets (Japan buys lots of US treasuries with their excess cash from trade). So, countries like Japan have a very, very, very strong vested interest in maintaining the status quo, i.e. low rates. More generally, many governments today – including Japan – would rather use fiscal and monetary stimulus than deal with economic problems – regardless of who created them. As such, they use policy tools to reduce interest rates, ramp up debt and continue spending more than they have. What frightens me is that there is no discernible end game – either in Japan or elsewhere – when using these tools. Japan is a great case study because we have 22 years to observe what happens when a government continuously uses monetary and fiscal stimulus in the wake of a credit bubble. It seems like U.S. and EU governments have been using the fiscal and monetary stimulus method as well in the past few years rather than deal with the economic problems. Ivan, I agree. Obviously, there are lots of moving parts when looking at a whole economy. However, it is clear that both the US and EU have avoided dealing with cause and effect. They seem to be more content with kicking the can and hoping for the best (or worse). I see. Before I read your article,I only know about that US and EU are using financial repression (by keeping the interest rate close to zero and thus making the real interest rate negative) to dilute huge proportion of their debt (just like what happened after World War 2),but now I see furthermore than that after reading your article. Nice article! Waiting for your part 2. Cheers! Thank you for this very nice article. Speaking for myself, the Japan case has always been a question without a specific answer. I guess this article wrapped things up for me. thanks Ron for posting this article ….nice overview of the Japanese economy ….i think, now i understand the Japan’s case much better …. hey ron nice article!! got an insight of how things work in japan…..
It’s no suprise. People filing for bankruptcy are at an all-time high. Pingback: Is Japan The Canary In The Keynesian Coal Mine?